A 2017 British study looking at the impact of a good diet on our physical performance confirms again that eating more vegetables, whole fruit, and whole grains -- and less processed foods like white bread, added sugar, and processed meat -- not only improves overall current health, but also dramatically improves our physical and mental strength, balance, agility, and vigor as we get older. This naturally leads to fewer broken bones and greater independence. The food choices mentioned in the study fit the pattern of a whole food Mediterranean diet, which has consistently been shown to be beneficial for healthy aging – a high consumption of vegetables and whole fruit, whole grains, beans, good fats like extra-virgin olive oil, eggs, unprocessed meat, and moderate alcohol. Whole food sources of protein, vitamin D, and antioxidants have been associated with improved muscle mass, strength, and physical performance in older age. The benefits? Less frailty and more independence, with a healthier brain and joints at every age. 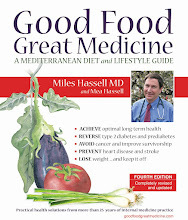 For more information and sources on graceful aging, see pages 15-16 in Good Food, Great Medicine, 3rd edition. Want to reduce weight or diabetes risk? Chew slowly! Also, the fast eaters in the study reported eating dinner 2 hours before sleeping and snacking after dinner, both high-risk habits for weight gain. Previous studies have confirmed these findings, so this isn’t new news. When we spend more time chewing our food, we feel satisfied sooner – the stomach takes about 20 minutes to get a message to the brain that we’re full. Eating a whole food Mediterranean-style diet with plenty of vegetables, fruit, beans, nuts, whole grains, and unprocessed meat naturally requires more chewing. On the other hand, the more foods are processed, the smaller their particle size, and the faster we can eat them. To read about other reasons to avoid processed food and liquid calories, see pages 9 and 74-75 in Good Food, Great Medicine, 3rd edition.